Believe it or not, these are the scents of our research, which has taken us across the European Arctic from Northern Scandinavia to many corners of Greenland. We're studying the release of a particular group of compounds from the Arctic tundra as the climate warms. On one trip, we helped out some of our colleagues to drill down into the frozen soil to retrieve a core of permafrost, and we noticed a strong, characteristic smell. We can best describe it as a nasty smell of rotten eggs blended with the fresh scent of soil after rain. And it is this stench that led us to believe that there is much more than just carbon dioxide and methane, both of which are odorless greenhouse gases, being released to the atmosphere when permafrost thaws. So, we brought back some of the permafrost soil to our lab in Copenhagen. We placed the samples in Mason jars, hooked them up to an extremely sensitive gas-analyser to see what these gases were. To our surprise we found not just a couple of overlooked gases, but several hundred different types of gases oozing out of the thawing permafrost. Many of them truly smell, but in the lab we discovered many more that are just as odorless as they are invisible. But what are these gases? And where do they come from? The answer lies in the bacterial life hidden away in these frozen soils. The gases belong to a group of chemicals that are collectively known as volatile organic compounds or VOCs, produced by bacteria. Permafrost soil might seem a rather inhospitable place with temperatures constantly below freezing. But, a single gram of this cold, Arctic soil can contain millions of bacteria. The majority survive by entering a metabolically inactive dormant state, but some of them have adapted to the harsh conditions and stay active. For example, some bacteria contain anti-freeze proteins that prevent ice crystals from forming in the cells by lowering the freezing point of water. In fact, permafrost hosts quite a large diversity of microbial life. They thrive in liquid brine veins that run through the frozen ground, where the freezing point is lower due to the large amount of salt. And they can also survive in the top of the permafrost, where melt water from the unfrozen soil above can infiltrate. Bacteria probably do not experience heartache or midlife crises, and life as a bacterium is probably not that complicated. Nonetheless, they do communicate with each other and their surroundings. Bacteria produce VOCs to act as signals that let other bacteria know when to reproduce or deploy defense measures against potential enemies. Other VOCs are released for no specific purpose. They are simply a byproduct of evaporation or a myriad of other activities going on in microbial communities. So, the permafrost gases we observed in our experiment were essentially products of old bacterial communication and metabolic activity. While bacterial activity in permafrost is very low, these gases can build up over a long time. As they slowly accumulate, they become trapped in these ancient permafrost soils, which can be millions of years old and eventually build up a substantial amount of gas. This could explain the large, quick gas release that we observed upon thaw. Of the hundreds of VOCs we measured, ethanol stood out in particular, as it accounted for 50 per cent of the mass released from the thawing permafrost. Ethanol gas indicates fermentation processes in the frozen permafrost. 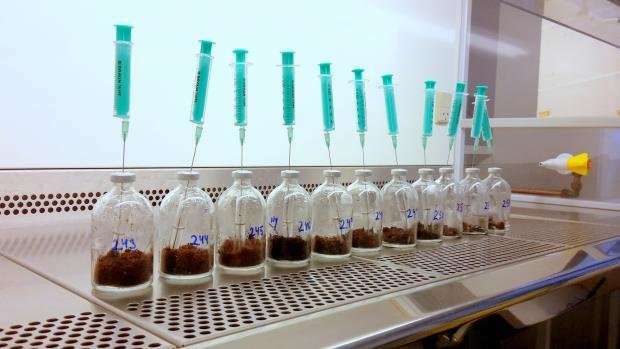 The amount of ethanol released was impressive and highlights the vulnerability of permafrost and the possible impact this reservoir of carbon could have on the overall chemistry of the atmosphere. 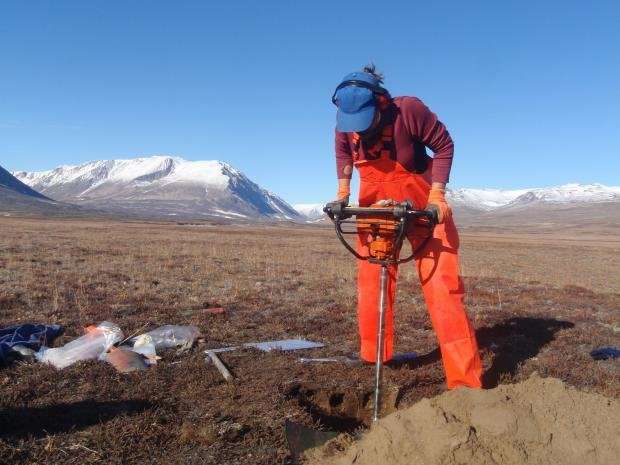 If we as a planet, neglect to reduce greenhouse gas emissions, then the subsequent global warming is likely to drive 40-80 per cent of the near surface permafrost soils to thaw by the end of this century. Assuming that all permafrost soils emit the same amount of ethanol as we have observed, climate warming will lead to the release of 1,000 billion tonnes of ethanol. This is equivalent to 21,500 years of traffic emissions from a city the size of Los Angeles, the most congested city in the world, assuming all cars used ethanol as gasoline. Like at least part of the human population, bacteria also eagerly consume ethanol. Permafrost is overlain by a layer of soil that thaws every summer—the so-called 'active layer.' The active soil layer harbors an active microbial community ready to booze on the permafrost VOC gases like ethanol, as they diffuse upwards to reach the atmosphere. We were able to observe these gases because we dug down into the deep permafrost and physically brought them up to the surface. At which point the frozen soil thawed and the gases were released. But what would happen in 'real life', if the gases were not physically disturbed in this way? Would they still reach the surface if they were left to diffuse up to the surface on their own? While VOCs are released by some bacteria, they might be food to others. So the question was if the permafrost VOC gases would be eaten by microorganisms living in the active soil layer, and so prevented from ever reaching the atmosphere? To test this, we set up another experiment, in which we compared the release of VOCs from mason jars with permafrost alone to mason jars that contained both permafrost and an active layer soil. We saw that the active layer was colonised by thirsty microorganisms as almost all of the permafrost VOCs never made it through the active soil layer. Does this then mean, that permafrost released VOCs will not affect the atmosphere? Most likely not. The Arctic is currently experiencing climate warming at twice the rate of the rest of the planet, and this means that the permafrost is thawing with increasing speed. Periodic freezing and thawing are powerful processes that cause landslides and push deeper soil layers to the surface. Such reshaping of the landscape exposes frozen permafrost soils to direct contact with the atmosphere allowing VOCs to by-pass thirsty bacteria. 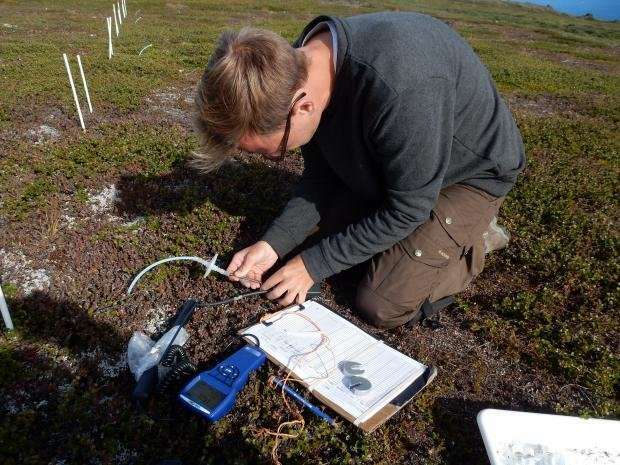 We also discovered another important process: that is, the ability of bacteria to consume large amounts of VOCs in the soil above the permafrost, even at low temperatures. Like bacteria, trees and other plants use VOCs for communication and defense purposes. And actually, VOC release from plants is 10-1000 times higher compared to soil. VOCs emitted from vegetation swirl around in the air near the ground, before they eventually reach the upper atmosphere. But what happens when these VOCs briefly land on the soil surface? If the soil effectively takes up plant emitted VOCs and thereby reduces the net release of VOCs to the atmosphere, this might have consequences for VOCs in the atmosphere. VOCs affect the atmosphere in a number of ways, many of which are not fully understood. For example, when mixed with traffic exhaust VOCs contribute to production of air pollution. They can also stick together to form tiny particles and even clouds, which can cool the planet. On the other hand, VOCs can also increase the concentrations of atmospheric methane and ozone, which are both potent greenhouse gases. So, right now, we are in the laboratory running experiments to figure out precisely how VOCs are released from the permafrost in different situations to understand how this might change in the future as the climate continues to warm. Climate scientists are interested in VOCs, because they can alter the physical and chemical balance of the atmosphere. Depending on the specific compounds, meteorological conditions, and what other gases they are mixed with in air, VOCs can have either a warming or a cooling impact on climate. VOCs facilitate atmospheric particle growth and induce cloud formation that cools the climate by reflecting solar radiation back to space. On the other hand, VOCs may contribute to the formation of ground-level ozone, which is a greenhouse gas. The reactions VOCs participate in may also prolong the lifetime of methane, another greenhouse gas. This has the potential to amplify climate warming.